Everyone knows this side of Naples, even if they’ve never seen it in person: the recumbent city by the sea, between Vesuvius and the islands of Capri and Ischia, warmed by the sun almost 365 days out of the year. The most spectacular place to start is the Parco Virgiliano on the summit of Posillipo Hill, a large forest of pine trees and garden terraces sloping down toward the sea. You’ll forget that you’re in the third largest city in Italy, after Rome and Milan. From any of its beautiful overlooks, you can admire the Bay of Pozzuoli to your right, with the Isle of Nisida connected to terra firma by a small isthmus. And on a clear spring day you can see as far as the islands of Procida and Ischia. Directly in front of you is the Island of Capri, one of the biggest tourist attractions in the world, and to your right, amid roses, bougainvillea and broom, is the most moving, classic view of the Gulf of Naples silhouetted by the Sorrentino Peninsula. In the distance is the famous Mount Vesuvius. The still active volcano famously erupted in 79 A.D., destroying the city of Pompei. A visit to the city, which remains almost entirely intact, is not to miss. Exiting Parco Virgiliano on foot, you’ll head down Via Posillipo. It’s about an hour’s walk to sea level, an area called Mergellina, but it’s well worth it. The beauty you’ll soak in on this walk has bewitched travelers, poets and writers for centuries. In Mergellina, stop by one of the attractive seaside chalets on the shore for a classic coffee in front of the port where hydrofoils depart for the islands. Continue down the boardwalk, recently transformed into a pedestrian- only area, Via Caracciolo. With the sea to your right, to your left stands the luxuriant Villa Comunale and Stazione Zoologica, a research institute devoted to basic research in marine biology. You can visit a small but precious aquarium, a unique remnant of the eighteenth century. In a half hour you’ll arrive at a small peninsula where the Castel Dell’Ovo is located, a seaside castle and the oldest standing fortification in Naples. Here is where Greek colonizers founded the first nucleus of the city in the 6th Century B.C. Several forts were built here under the Roman, Norman and Aragon empires. The current castle towers over Borgo Marinari, a small fishing village founded in the 19th Century, where you can find exquisite restaurants (don’t miss the famous Zi’ Teresa, the perfect place to eat fish). 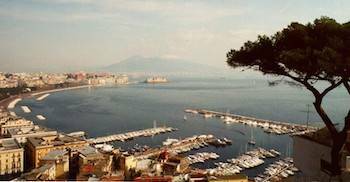 From here you can admire Naples from the sea, with Posillipo hill in the distance, as well as a series of luxury hotels, tons of restaurants and pizzerias, and a crowd of Neapolitans and tourists strolling down the boardwalk. Now it’s time to head into the heart of the city, toward the immense Piazza del Plebiscito, which extends out in front of the Royal Palace. 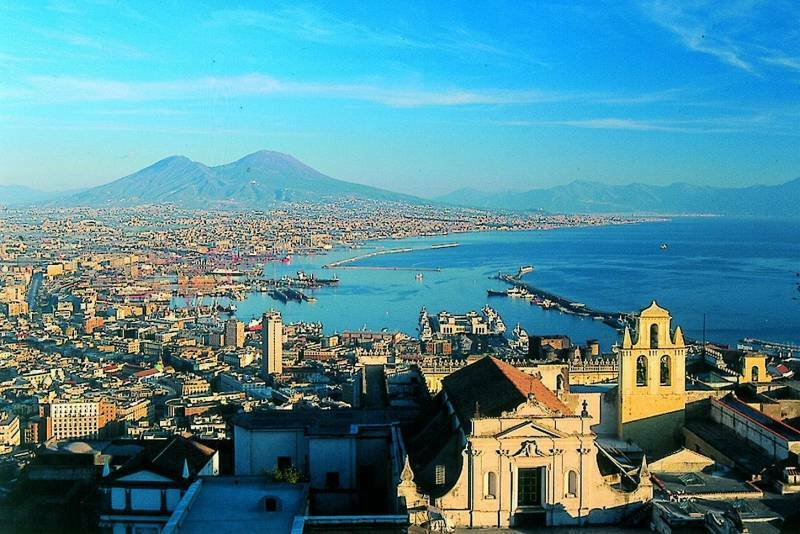 Remember that up until 150 years ago, Naples was the capital of a kingdom that included all of Southern Italy as well as Sicily. From Borgo Marinari you can arrive by passing through Santa Lucia, an old fishermen’s neighborhood, or by climbing up elegant Via Chiaia, with its boutiques, cafes and the famous Pizzeria Brandi, where in 1889 Raffaele Esposito “invented” the most famous pizza in the world: the Margherita. The pizza got its name when it was offered to the royal couple Umberto I and Margherita of Savoy on their visit to Naples. The Queen loved it, apparently. Whichever road you take, after a little while you will wind up in Piazza del Plebiscito, one of the grandest squares in Italy. In front of you is the Palazzo Reale, adorned with gigantic statues of important kings of Naples: from Ruggero il Normanno (12th Century) to Gioacchino Murat (appointed King of Naples by Napoleon in 1808), and Vittorio Emanuele II (the first King of Italy). With help from the famous general Giuseppe Garibaldi, the latter king conquered the Kingdom of Naples and unified Italy in 1860. American tourists should know that after this campaign, Garibaldi was offered a leading position in the US Army during the American Civil War. But he would only accept the post on one condition: that the war’s objective be declared as the abolition of slavery. Since at that stage Lincoln was unwilling to make such a statement, Garibaldi refused. Nearby is the Teatro San Carlo, the oldest opera house in Europe, founded in 1737. Damaged by fire in 1816, the theater was rebuilt by the architect Antonio Niccolini. Today the magnificently revamped theater is open every day for guided visits. Just across from the theater is the legendary Caffè Gambrinus. Established in 1890, the Art Deco café is furnished with small café-chantant tables. The café has long been the preferred watering hole of artists, politicians, intellectuals, writers and poets, including Gabriele d’Annunzio, Oscar Wilde and Ernest Hemingway. It is still one of the cultural landmarks of the city. 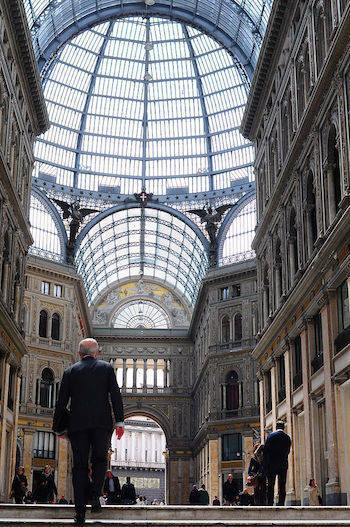 Continue on to nearby Galleria Umberto, a living symbol of the 18th Century. Founded as a commercial center, it was the city’s first movie theater. Today the Galleria is one of the most awe-inspiring architectural feats in the city, boasting marvelous statues and mosaics, as well as elegant shops and cafes. Speaking of shopping, you can enter Via Toledo from the Galleria. The street has been famous since the 16th Century. The mile-long road is dotted with all kinds of stores and circumscribes the Spanish Quarter, a popular area composed of dozens of side streets—the city’s famous “vicoli”—running up the hill. Here you’ll find Pasticceria Pintauro, a pilgrimage site for pastry buffs. This is where, in 1785, the first sfogliatella was made, the most famous pastry in Naples. Sfogliatella is a crunchy shell-shaped pastry stuffed with ricotta and candied fruit. At the end of Via Toledo you’ll arrive in Piazza Dante. Continue toward the ancient heart of the city by passing through Port’Alba, a small street known for its modern and antique bookshops. From here it’s a short walk to Piazza del Gesù Nuovo, where you can admire the baroque church of the same name erected for Jesuits at the end of the 1500s. The church’s sides and façade form a diamond. Inside, you’ll find exquisite frescoes. A little farther on is the Franciscan complex Santa Chiara, one of the most intriguing monuments in the city. The gothic church was erected in the 1300s and would go on to become a pantheon of Neapolitan regality and nobility. The basilica contains one of the most fascinating Italian interiors of the 18th century, meticulously preserved until the bombings of 8 August 1943, and skillfully restored later. One of the most enchanting parts of Santa Chiara is the majolica Cloister, decorated with blue, green and yellow ceramic tiles. The colors reflect the sky, vines, and lemons grown in the church’s elegant garden. 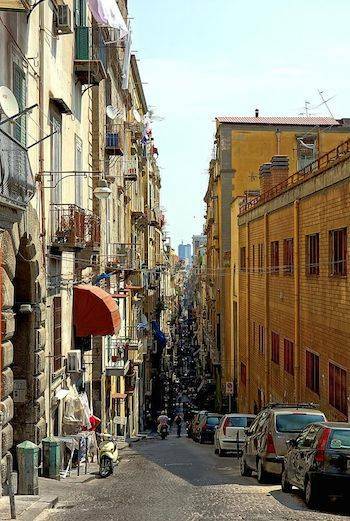 You should now be on a street known as “Spaccanapoli” (Split Naples)—so called because it appears to divide the city into two parts. From here, stroll by ancient artisanal bodegas to arrive in Piazza San Domenico Maggiore, without a doubt one of the most beautiful piazzas in the city. Surrounded on three sides by major 17th Century palazzos, the piazza is also home to the Church of San Domenico, a large convent dating back to 1200. An interesting side note for Americans: here is where the first Catholic bishop of the Archdiocese of New York, Richard Luke Concanen, is buried. Concanen was an Irish priest who never actually set foot in New York. Ordained in Rome in 1808, he never got past the port of Naples due to an embargo during the Napoleonic Wars. Until his death in 1810, he ran his diocese via a correspondence he kept with the missionaries working in New York. After you visit the church and take a coffee break at one of the piazza’s many open-air cafes, we recommend stopping by the Cappella di Sansevero, founded in 1560. It’s well worth a visit to see the many peculiar works of art commissioned by the chapel’s most famous proprietor, the Prince of Sansevero, a 17th Century scientist, alchemist and mason. 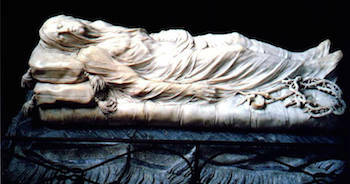 The Cristo Velato is the most beautiful and famous work on view. Today, the chapel hosts exhibitions, concerts and art shows. Exit the chapel onto Via dei Tribunali, one of the liveliest streets in Naples’ historic center—the heart of “authentic” Naples with its narrow alleys and its street vendors and street life. 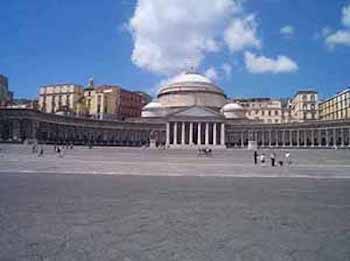 Conclude your tour of ‘monumental’ Naples by following the street to the Duomo, the Cathedral of Naples and seat of the Archdiocese. Completed in 1313, the gothic church has been rebuilt and reworked many times over the centuries. It is dedicated to Saint Gennaro, or Januarius, Bishop of Naples in the 3rd century A.D, martyr, and patron saint of the city. This is the most important site of devotion for Neapolitans. Every year the church holds a ceremony for the Blood Miracle of Saint Gennaro. The church also houses the Museo del Tesoro di San Gennaro, a place of extremely important artistic, cultural, and spiritual value containing priceless documents, precious objects, jewels, and paintings. On Via dei Tribunali, you’ll find Piazza San Gaetano, gateway to the most intriguing and mysterious part of the city: Underground Naples, a complex of tunnels and caves carved out of the city’s subsoil. Its origins are ancient; the Greeks dug enormous caves to extract limestone for fortifying the city. Later on, the Romans built a large underground aqueduct and a network of tunnels stretching dozens of miles. During World War II, these underground tunnels were used as air raid shelters. Today you can visit many of the tunnels for a chance to brush elbows with 2400 years of the city’s history. Of course, you also have to go underground to find a city’s catacombs. 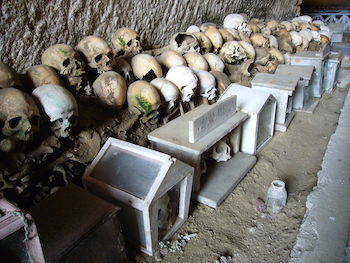 The underground cemeteries were created during the classic age by Naples’ Christian community. They are second only to Rome for their archaeological and artistic importance. Over the course of centuries, these artificial caves have formed to create the urban skeleton of the city. Architecturally, they are replete with bas-reliefs, frescoes, crockery, urns, terracotta statues and mirrors. Among them are the catacombs of Saint Gennaro, an extremely important, monumental complex with many precious mosaics and frescoes. The site was used continuously for roughly eight centuries and represents a major testimony of the life of the Christian community. Another captivating site to visit underground is the Cimitero delle Fontanelle (Cemetery of the Little Fountains), an ancient ossuary that spans roughly 3000 square feet. The cemetery dates back to the 16th Century, when the city was decimated by the plague. In the following centuries, during times of major catastrophes like famine, earthquakes or volcanic eruptions, the Cimitero delle Fontanelle was used to accommodate corpses. The Neapolitans have never ceased visiting the place, bearing flowers for their ancestors, about whom the most enthralling stories and legends are told. But underground Naples is not the exclusive property of the ancient world. 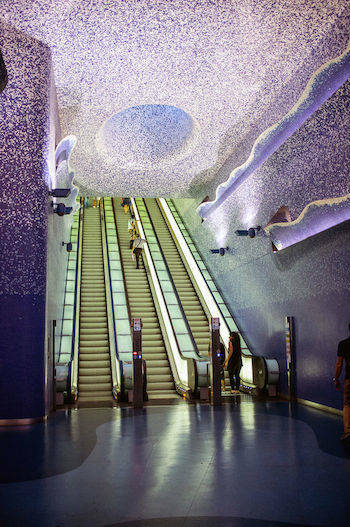 Another underground Naples has emerged (in a manner of speaking) in recent years. The new subway network is, according to curator Bonito Oliva, a bona fide “indispensable contemporary art museum.” The subway tunnels do in fact contain a permanent art installation comprised of nearly 200 works of contemporary art that travelers are “bound” to see. These “art” stations began cropping up in the mid-90s, combining various artistic styles practiced by over ninety internationally renowned artists. Equestrian statues, mosaics, futuristic animals, vehicles from different eras, reproductions of archaeological digs—they are all perfectly integrated into the remains of the old city, and thousands of commuters get to see the spectacle flit by day in and day out.